I'm going to miss "American Idol." The show, yes, but also what the show represented about the United States and about television. "Idol," a British import, dominated American TV like no other show has in this young century. It set ratings records that boggled Fox executives' minds; made Rupert Murdoch even richer; spawned a whole new category of reality shows; and introduced the world to stars like Carrie Underwood and Kelly Clarkson. This week the show is over, at least for a while. On Tuesday night Fox will show a special documentary about "Idol;" on Wednesday night America will be asked to vote for a winner; and on Thursday one more "American Idol" will be crowned during a star-studded finale episode. The show is a shell of its former self, averaging about 8 million viewers now, one-fourth of its peak audience 10 years ago. When I visited the studio last month, the place felt a little bit like a time capsule. This season has felt like a necessary goodbye. But when I think about "Idol," I think about the highs, not the lows. About the symbolism of an aspirational American talent search launching in the scary months between the 9/11 attacks and the invasion of Iraq. About the interactivity, now taken for granted, of viewers deciding the outcome by voting at home! And about the communal experience of watching the same live performance as 30 million other people. Remember, "Idol" premiered before the iPhone, before Twitter and before Snapchat. By encouraging participation (first by telephone voting, now through a myriad of voting options) the TV show was a form of "social media." When season one premiered in the summer of 2002, Fox was not expecting it to become a bonafide TV phenomenon. But the sinister Simon Cowell and sweet-hearted contestants like Clarkson turned "Idol" into must-see TV. The first episode reached about 10 million viewers and the finale averaged more than 22 million. Season two, in the winter of 2003, was even bigger. The show "achieved the truly impossible, building an empire in a tottering industry, the likes of which had not been seen for decades," author Richard Rushfield wrote in "American Idol: The Untold Story." Rushfield said the season two ratings were beyond the "wildest dreams" of Fox executives. By the time Ruben Studdard beat Clay Aiken in the finale, more than 30 million people were watching. In a TV industry that was already starting to fragment into dozens, and then hundreds, of smaller and smaller pieces, "Idol" was like glue, holding some of the pieces together. "Idol" was family-friendly, big-tent TV that encouraged groups of people to gather around the big screen. The show lifted the entire Fox network into first place, above its rivals NBC, ABC and CBS, for eight seasons in a row. After a while, I felt like I ran out of ways to describe the ratings dominance of "Idol." The show was so far ahead of everything else, even "Dancing With the Stars" and "Survivor," that the ratings actually stopped being fun to write about. But the auditions and the agonizing weekly eliminations gave critics and ordinary viewers fun, fresh storylines each and every season. 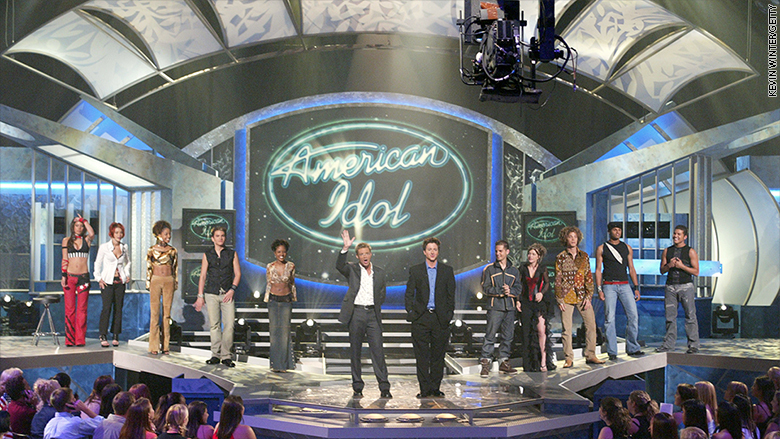 In the mid-2000s the Fox bosses talked about the scheduling of "Idol" in militaristic and psychological terms, with "shock and awe" tactics that drove other networks crazy. If another network wanted to introduce a new show and give it a chance to succeed, it wouldn't dare put it up against "Idol." That was a death wish. In the summer of 2008, CBS chief Les Moonves gave voice to years of understandable resentment among rivals. "While we're in repeats, 'American Idol' continues to be a monster. It's a phenomenon," he said. "If somebody would kill that show, I'd really appreciate it." Every season it became harder and harder to entice new viewers to give the show a shot. Competitors like "The Voice" ate into "Idol." Comings and goings at the judges table hurt the show too. And the very definition of fame changed as teenagers with YouTube and Vine accounts became pop idols without Fox's help. "Technology piled up, then piled on," Newsday TV critic Verne Gay wrote recently. "Facebook arrived in 2004, YouTube in 2005. Hulu signaled the advent of streaming TV in 2007. Netflix supercharged that revolution in 2010." And "Spotify allowed listeners to find their own superstars." True. And yet scrolling through playlists on Spotify is a solitary experience. Watching television doesn't have to be. When host Ryan Seacrest — the only on-air constant throughout all 15 seasons — tosses to commercial by saying "American Idol will be right back," I can feel millions of other viewers watching. Even though the ratings aren't record-smashing anymore, the sense of togetherness is still intact. Will we ever be able to say that about another TV show? That's why I'm going to miss "Idol." But maybe not for long. The show's creator, Simon Fuller, is already plotting its comeback. "The next generation of Idol will be a lot more interactive, a lot more immersive," he told The Hollywood Reporter. Feeling like you're watching with millions of other people will be heightened when you can see the exact number of fellow viewers in the corner of the screen, or when a virtual reality headset allows you to be "in" the studio. Fuller said his head is "exploding with opportunities." "The next generation of Idol -- and Idol will certainly be coming back for sure -- will have a youthful glow and it will be pioneering again, just as it was when we first began," he said. I give "Idol" five years til it's back.